Read a Maybelline foundation review. With the Maybelline makeup popular slogan, "Maybe she's born with it. Maybe it's Maybelline," the company has paved the way for women to enhance their beauty, even if they aren't born looking like models. This makeup company has grown from a family business to a true global beauty force. Maybelline is known for excellent quality, and this cosmetics is used by famous makeup artists. In fact, Maybelline has won many awards for their products. Yet browse the packed cosmetics aisles of virtually any drug or department store, and you're bound to see dozens of Maybelline beauty products sitting proudly on the shelves. While the products are high quality, they are also abundantly available at prices that are affordable for the everyday woman. As the seasons change, so should your makeup colors and coverage. Maybelline's availability and affordability not only means that the average woman can look and feel like a million dollars, but also she can afford to update her makeup looks more frequently. Additionally, much of Maybelline's popularity is due to the wide variety of cosmetics the company offers. From classic colors and makeup essentials to hot, new, contemporary colors and products, people from all age groups can find something to love. Maybelline's foundations, powders, and concealers strive to offer flawless coverage while at the same time benefiting and nourishing skin. Anti-Aging: Instant Age Rewind products like foundation, concealer and product are good products for fighting the appearance of fine lines and wrinkles. Problem Skin: The Shine Free and Dream Matte products include foundation, concealer, and pressed or loose powders. All these help alleviate the shine associated with oily skin. On the Go: SuperStay products are perfect for busy women who need to look great in a hurry and stay that way throughout the day. The girl next door can look like a makeup pro with Maybelline's easy to use makeup for eyes and cheeks. They offer a wide variety of blushes, bronzers, shadows, liners, and mascara for every look from professional to sultry. Mascara: Maybelline is well known for its mascara. Most of their formulas are available in washable and waterproof formulas. Some are also available with curved brushes to facilitate lash curl. Top products include the award-winning Great Lash Big, Lash Stiletto, and Volum' Express. Shadows: Eye Studio shadows are available in trios, and four pan color combinations to customize the look that's perfect for you. Expert Wear offer a variety of looks for your makeup palette. Liners: Eye Studio's Lasting Gel Liner, and Define-A-Line Eyeliner make eyes pop! In addition, Maybelline has liquid and waterproof liners for looks that last. Discover distinct brows with Brush-On Brow color or brow gel. 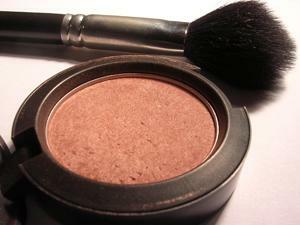 Blushes: Fit Me and Dream Mousse blushes and bronzers offer a healthy-looking, beautiful glow in a variety of colors. Lipsticks: Micro pigments in ColorSensational High Shine give lips a touch of color and lots of shine. There are ten shades of lip colors in this line. Lip gloss: With 12 shades, ColorSensational Lipgloss has every color you need. Lip liner: Get smudge-free lips that look flawless. ColorSensational Lip Liner comes in twelves shades. This product proved to be one of the most popular in the current product line. Many reviewers were attracted by the packaging and intrigued by using a pump foundation. Reviews reported that Fit Me felt light, and overall, provided smooth coverage. The downside was that dark spots on the skin required concealer before the foundation application. Reviewers said these lipcolors lasts a long time and stayed on even after eating, kissing, sleeping and even brushing your teeth. This product was easy and fun to use but it can leave lips feeling dry if used daily. People who want to hide dark circles around the eyes gave this product a try. Most of the reviews we read said that this color doesn't goop up in the wrinkles and creases. Instant Age Rewind Eraser Treatment decreases dark circle effectively, but a few said that the applicator was tough to use. If you'd like a little more advice on how to apply Maybelline products use tutorials. The following tutorials will help you apply the products properly. If you are interested in getting free Maybelline makeup samples, sign up for e-mail alerts for new products on their website and you can receive samples of hot new cosmetic items. Check ads in your favorite magazines as well, many of them offer giveaways for new or award-winning Maybelline makeup products.